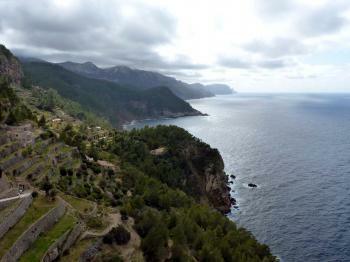 The Cultural Landscape of the Serra de Tramuntana is a man-made landscape on a mountain range on Mallorca. Its features include the hydrological system, dry-stone structures, rural estates, towns and villages, religious centres and maritime heritage. Even though Mallorca seems to be supercrowded at all times, especially when the cruiseships come in, the island came as a pleasant surprise to me. Palma is a very nice city (and the cathedral would probably be already a WH site if it were in any other country) and the mountains are exceptionally scenic, sometimes even spectacular. The Serra de Tramuntana range is the spine of the island (and protects the beaches from the northern winds) and reaches a height of over 1,400 metres. It includes several pretty towns and various monasteries, including the huge one at Lluc. Even though it is not really easy to find out where the core zone of the WHS starts and what is only in the buffer zone, you can be reasonably sure that any trip to the northern coast will make you traverse the core zone. The site is inscribed as a cultural landscape, and it is quite easy to make out various aspects of this as you make your way through the mountains, especially the historic stone walls separating the fields, some of which date back to Arab times. I did two trips to the mountains, both of them very much on the tourist trail and likely to be offered by various agencies - the half-day trip to Valldemossa to visit the Charterhouse (of Chopin and Sand fame) and the full-day trip to Sa Calobra (very winding roads and extraordinarily scenic), followed by a boat ride to Port de Sóller, a tram ride to Sóller, and a train ride back to Palma. Mallorca’s “Sierra de Tramuntana” consists of a limestone range around 90kms long, 15kms wide and up to c1450m high, running along the north of the island. We found that it offers attractive scenery which, particularly along its coast, sometimes reaches the level of “spectacular”. Whilst some of its scenery is “wild” mountain and pine forest, much is also the result of human activity. However, its inscription as a WHS “Cultural Landscape”, seems to me to rate this latter aspect excessively highly and to illustrate a number of unfortunate directions which the “World Heritage” scheme has taken in recent years – A State Party determined to gain an inscription for every province and island. An Advisory Body (AB) which grinds very small on criticising detail but seems unwilling to stand up and be counted on the major calls as to whether a site really has “OUV”. And finally a WHC which operates on whim and politics and ignores its AB! The Nomination File extends over 1300 pages. How much of this reflects the growing reaction by States Parties to being asked ever more detailed matters by the AB during the nomination process and how much is a symptom of a belief that the “thicker” the dossier is then the more “points” it must score, is not clear! But an immediate fact which strikes one is that large parts of it do not relate to the area proposed for inscription at all!! Much of it is about the very large areas allocated as “Buffer Zone” (BZ) - c78k ha compared with the inscribed area c30k ha, and some of it strays beyond even that! A few examples. 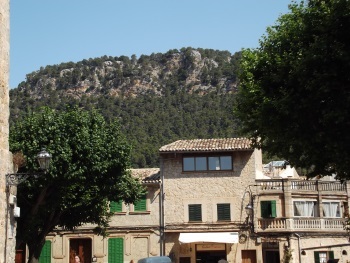 Previous reviewers have commented positively on the towns of Soller and Pollença – and pleasant they are - but neither is actually within the inscribed area even though they are described in the dossier. Its general approach is to cover the attributes of the entire area which is traditionally and administratively described as being the “Tramuntana” without differentiating between what is to be included as “core” and what is placed in “buffer”. A rather unclear map shows the two areas coloured green and brown but provides little in the way of topographic reference points to permit the descriptions to be related to it! Now it has always been my understanding that the sole purpose of BZs was to protect the OUV of the “core” inscribed area and that they were not supposed to have any merit in themselves – indeed if they did, then this was either irrelevant to the nomination case being made or, potentially, could lead to criticism as to why they had not been included in the core! Thus, locations within a BZ cannot be regarded as being “Inscribed”. But, in the Tramuntana dossier, we get reference to Pollença’s music festival and a description of its churches, whilst the (excellent and free to enter!) Joan Miro exhibition at Soller’s railway station is also described. Down in the SW, the entire municipality of Andratx is excluded from the core zone. Indeed much of it isn’t that “special” - yet EVERY town and village within it which we saw has, at its entrance, a sign proudly proclaiming it as “Patrimonio Mundial” and sporting the official UNESCO logo! Next, the entire Formentor Peninsular in the NE of the island is relegated to the buffer zone, despite being very spectacular indeed and one of the island’s scenic “hot spots”! Yet the Nomination dossier includes a large photo of it, together with a description of its historic lighthouse! I presume that this scenic “star” has been excluded because, as a whole, it possesses very little CL value - but this hasn’t prevented the UNESCO logo etc being replicated at every opportunity along the road to the “Cap”. Spain and Mallorca are obviously determined to “milk” the WH inscription across as large an area as possible! So, how did this extensive (and expansive!) Nomination dossier fare? Well - ICOMOS concluded that none of the proposed criteria ii, iv, v or vi had been demonstrated and, among other criticisms, didn’t like the “Comparative Assessment”, commenting that it “considers that the property is a good, although common-place, example of human adaptation to difficult environmental conditions, and of traditional knowledge developed to carry out farming with limited resources, both in terms of land and water.” – faint praise indeed! But it didn’t recommend “Rejection” and adopted the stance that a “Deferral” might permit yet more detailed work which “might” identify OUV etc. Spain obviously launched a strong rear-guard action and provided a series of further documents to try to answer the criticisms – but the real “coup” came at the 2011 WHC. Live-casts had not commenced back then but I have access to some notes taken by someone who did attend and the process which decided to inscribe the Tramuntana is illuminating – it was discussed fairly late on in the afternoon and perhaps the delegates were all getting a bit tired! ICOMOS was still hanging on for “deferral” but Jordan took the lead in proposing inscription on all 4 requested criteria (I wonder why - it had already achieved success a couple of days earlier with its own Wadi Rum - my there been some “pay back” going on?!). Mexico was also in support but was prepared to ditch Crit iv. On the other hand Oz, Swe and Sui all supported ICOMOS. No one else said much, though Egypt was prepared for a “referral” – a complication which no one wanted to countenance! So the Chair put Jordan’s proposal first, no one could be bothered to argue and it was adopted “nem con”!! Thus do (some) sites find their way onto the Inscribed List!! Well - for better or worse it IS inscribed, so one might as well try to get the most out of it if one visits! What should you look for? The first thing to recognise is that inscription was as a “Cultural Landscape” (CL) with values relating to land use, architecture and associative “artistic/literary works” etc rather than to geology or scenic beauty. So you should be looking at a lot of terraces and dry stone walls! The Dossier describes many of them in “loving detail” - “we must highlight an extraordinary wall known as Sa Regata, which supports part of the Sa Calobra road, standing 17 metres high and covering 1,800 m2.”! The site also majors on “Water management” so you should also be on the look out for cisterns, canals and Noria mills! Watch towers are another frequent construction (with a long list in the dossier!!) - the most famous (and touristy) one on the coast at Ses Animes is certainly worth stopping at for its views (photo) and that at Albertcutx on the Formentor peninsular (so outside the core) provides a great view AND an “interesting” drive. The agricultural crops (particularly olive growing) and buildings, together with the layout of landholdings etc are also an important aspect of the CL and much of the coast-facing central area owes its current aspect to its having been developed/conserved by Archduke Ludwig Salvator of Habsburg-Lorraine around the 1870’s who bought up many of the estates. You can visit his house near Deia - we didn’t, but it is still worth understanding his role in the area as developer and conservationist (he wrote a 7 volume book on the Balearics – their nature, history, architecture etc). Finally there are the artistic/literary associations - Chopin (who stayed for a “winter” season with George Sand in 1838) gave the tourist authorities a good sound bite by saying that Valldemossa was “the most beautiful place on Earth”. However, I saw NO mention made of George Sand’s comment that “We felt like prisoners, far from any enlightened help or productive sympathy” made during a hard winter and in the face of locals who disliked her “morality”!!! I personally found Valldemossa, with its crowds come to see the shrine of Mallorca’s patron saint as well as to “pick up” on Chopin (the tour of the museum apparently ends with a “live” piano recital - we didn’t bother!!) a bit of a disappointment. I also can’t establish 100% that it is in the core area – the Nomination merely states that the boundary “runs along the slopes of “Sa Comuna”, following the southern face of the valley where the village of Valldemossa is located until it reaches “Son Ferrandell” estate” – but which side is the village? 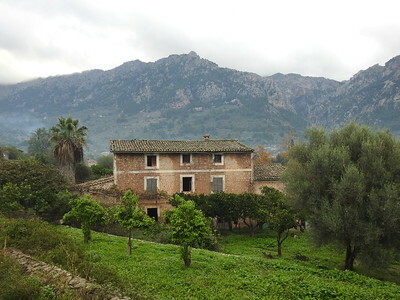 On page 33 of the Nomination it is stated (after a list of “municipalities” including Valldemossa) that “Only one of them – Deià - is included in its entirety in the core area. But, since “Municipalities” are bigger than towns it really is impossible to say! Deia too has significant “artistic” associations - this time from Robert Graves who lived nearby for over 50 years and who gets a few pages to himself in the Nomination dossier. Maybe we were lucky but I got the feeling that Deia with its steep streets was far less of a “coach” destination that Valldemossa. We rented a car and, as mentioned by Philipp Peterer below, it was ludicrously cheap. You need 2+ days really to “do” the Tramuntana from SW to NE even by car. The roads are in excellent condition and quite fun to drive – especially the one down to Sa Calobra ! But Mallorca, away from the beach resorts and its fine capital at Palma, is a major destination for cycling and walking and the nomination dossier describes in detail its 2 main hiking routes - one of which, surprise, surprise, is titled “The Dry stone Route”!! We didn’t do any serious hiking but I suspect it could be a good way of getting “closer” to the Cultural Landscape as well as to the natural scenery. In conclusion - the WH list isn’t short of karst-based, heavily terraced CLs requiring water management techniques so I am with ICOMOS that the man-made aspects of this site don’t demonstrate any particular OUV! 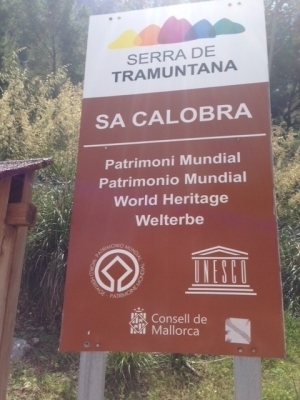 Nevertheless the Tramuntana area has its attractions and we enjoyed our exploration of it as part of a wider tour of Mallorca. If anyone wants a good book (Nb - not a “guide book”) on Mallorcan (including the Tramuntana) history, culture, countryside and architecture etc with good content and photos for both preparation and souvenir, I recommend this from the Konemann stable, originally published in 2000 and widely available 2nd hand remarkably cheaply - ISBN 3-8290-2597-1. For a small island, Mallorca enjoys a variety of landscapes, and those of the rugged Serra de Tramuntana are quite spectacular. I visited the towns of Soller, Villahermosa and Polenca. I reached Soller by various means. The antique wooden railway carriages of the old train were interesting, but much of the scenery was missed passingn through tunnels. Similarly with the direct bus, which traversed several tunnels. But the views from the bus via Villahermosa were amazing. And stopping off to walk the narrow streets of Villahermosa I was rewarded with other views of the Serra. To reach Polenca I had to travel the full length of the Serra de Tramuntana. This town lies at the conluence of several mountain streams, all of them dry at the time. Albeit inscribed as a cultural site, the Serra de Tramuntana is mostly worth a visit because of its stunning landscape. The mountain range can be visited on an easy daytrip from Palma de Mallorca. We took the highway from Palma to the north and started in Pollença. From there, the Ma10 runs right through the Serra de Tramuntana, direction Palma. You will see plenty of terraces, dry stone walls and beautiful olive tree plantations. The real highlights are the small bays along the coastline. Don’t miss Sa Calobra, a scenic bay, only reached by a winding road, about 12km off the main route. Sóller, a small mountain town, is also a pleasant stop. I can recommend visiting the island during off-season. Car rental is ridiculously cheap (about EUR 8 per day) and you get a bargain on hotel prices. Temperature was still a nice 20 degrees in late November. 3.0: Martina Ruckova Philipp Peterer Walter Klaus Freisinger Peter A.
ICOMOS recommended deferral. OUV (Crit ii, iv, v and vi) not demonstrated and needed more work. Also needed better comparative analysis and management. Jor led case for inscription on original criteria, Aus, Sui opposed. Egy wanted referral and Mex opposed only Crit vi. Site was inscribed on that basis. Icehouses: Description of "hydrological landscape" in AB Eval "structures to store snow and make ice". Lazarus species: Majorcan midwife toad: described from fossil remains in 1977, living animals discovered in 1979. Controversial at inscription: ICOMOS recommended deferral. OUV (Crit ii, iv, v and vi) not demonstrated and needed more work. Also needed better comparative analysis and management. Jor led case for inscription on original criteria, Aus, Sui opposed. Egy wanted referral and Mex opposed only Crit vi. Site was inscribed on that basis. 94 Community Members have visited.